Caught a show last week at the First Unitarian Church near 21st and Chestnut in Philadelphia. When I attended the Art Institute of Philadelphia just out of high school, we ‘dormed’ at the apartment house, then called the Ambassador Townhouse, at 21st and Chestnut, right across the alley from the church. I met my wife there on top of the building one night. It was strange to be standing in the alley with a friend waiting in line for the show 17 stories below my wife’s original apartment, 1818, (I’m pretty sure there was no 13th floor) 24 years later. It was also a little strange to be in the basement of the church with about 100 other people who appeared to be less than half my age. I’m pretty sure that I was the 2nd oldest person in the crowd. 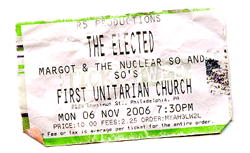 I went to see The Elected but was wow’ed by Indiana’s Margot & the Nuclear So and So’s. I had one of their songs, Skeleton Key, on my ipod and enjoyed it. Listening here and there on the commute was nothing compared to seeing them live. Their studio work only hints at the potential for rocking they gift to the fans and converts that have shown up at venue’s around the country on their current tour. The eight-member band — which includes a supplemental percussionist who drives the beat home with his marching band big bass drum and other noisy toys — features a myriad of instruments that create a wall of sound that is rare on the small club circuit. How do they fit all of them –and their instruments too– in their van? If you get a chance, catch them — they’re sure to rise up.